Q&A Day - Questions We Didn't Get To: LAST ONE!!! Is that Miracle Water in your bottle? Q&A - Questions We Didn't Get To: Are You There, God? What is the point in continuing searching for God if every time I read or pray, he is NOT there? Every time I ask others, they say “You gotta get in the word...” but I’ve already been there, and keep trying, but GOD APPEARS TO BE NOWHERE, so what is the point in searching for God, if he’s not there? How come he seemingly appears for others but not me? With all sincerity, I would like to ask the person who submitted this question what exactly s/he is looking for from God. Dealing with the very last question first – I don't know anyone (sane) who says God “appears to them” in a visible sense. He has never appeared to me that way, either. His presence in this age is His Holy Spirit, who resides within you and changes you. Someday, we will be in His actual presence, we will be face to face with our Lord, but until then, He has ordained faith as the way of walking with Him. I would also tell this person to ask those “others” who say they experience God's presence to please explain what they mean by that. Hear them out – maybe they experience God in a way that you never understood before – but can have opportunity to yourself. 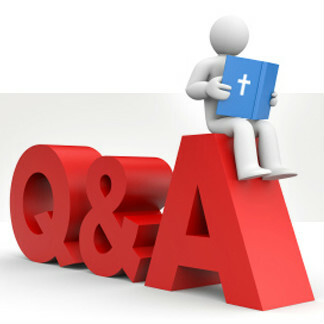 Q&A - Questions We Didn't Get To: What did God mean by "one of us"...? In Gen 1:26, God says man is made "in our image" but after the fall God says the man has "become like ONE of us in knowing good and evil" What does He mean? Wow, this is going to be hard to keep short. I'll try. Soooooo much to talk about here. The plurality in 1:26 refers to the Godhead. God is 1, but exists as 3 Persons: Father, Son, Holy Spirit. We are 1, but 3 as well, you could say, as we are body, mind, and spirit. There is more to you than what you see when you look in the mirror. It's a hard analogy, as is anything trying to compare to the Almighty God. BUT, I heard one preacher put it this way: God knows evil like sunbeam on sewage – untouched, unfouled. Man knows evil like someone drowning in sewage. That's all the further I take 3:22 – I don't read anything more into it, personally.